I’m back from South East Asia after the most amazing break and wanted to share some small tales of my travels with you. 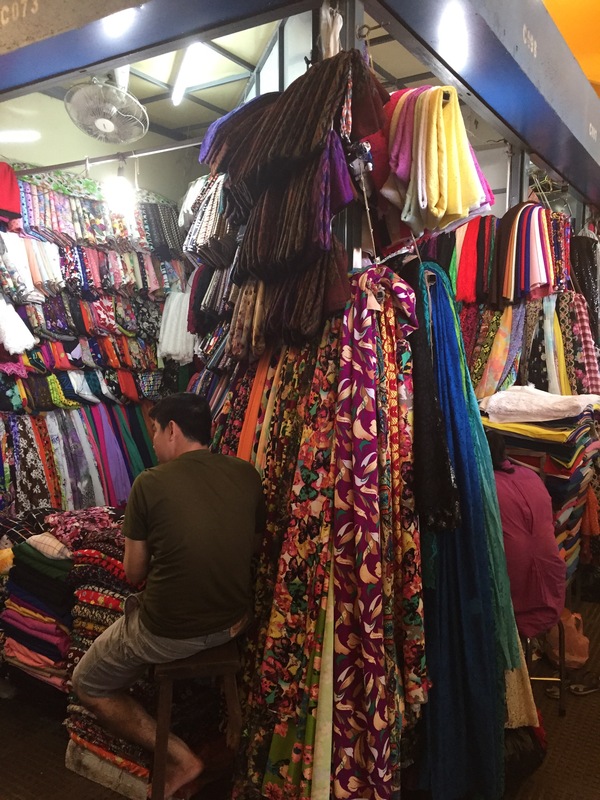 I was surprised to find that sewing followed me on my travels (which is daft really seeing as Cambodia is one of the world’s biggest garment producers!). 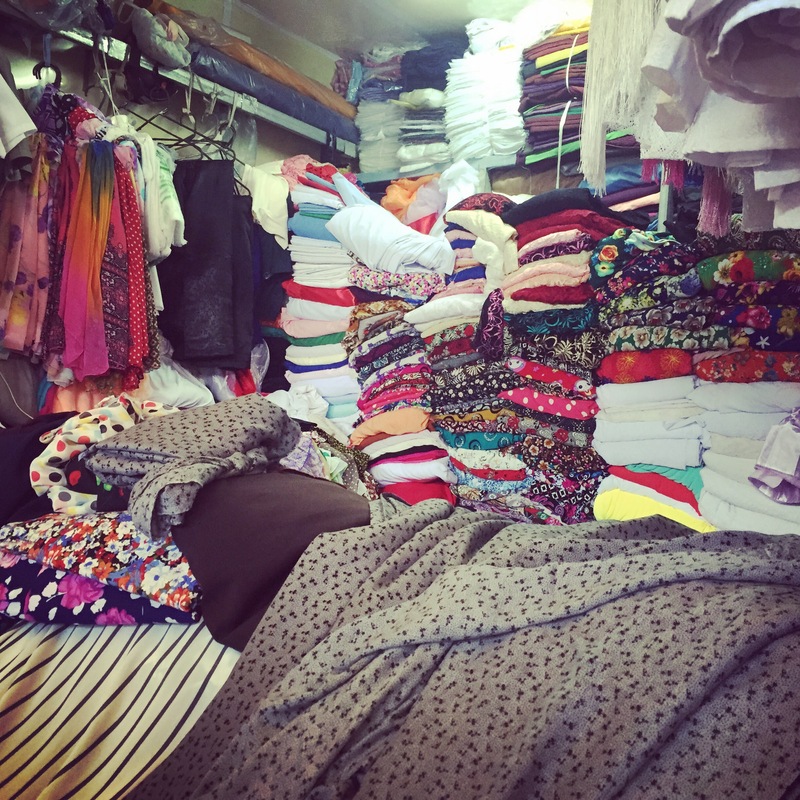 I saw everything from huge garment factories to individual seamstresses and it really gave me some sewing food for thought. 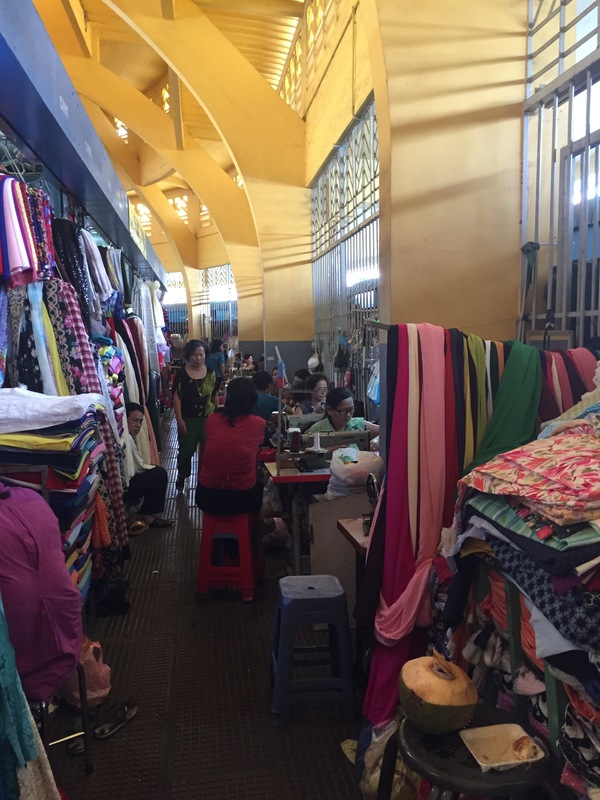 On the one hand, I am glad that through sewing my own I am not contributing to the cramped conditions of thousands of Cambodian women crammed on to trucks to go to work in the factories every day. On the other hand, for those women it is a valuable source of income. Many of the factories that were busy last time we were in Cambodia are now up for sale … apparently Cambodia just isn’t cheap enough anymore and people have cottoned on that “made in Cambodia” is not always a good thing. It makes me sad to think of all those women out of work. I guess it’s a fine balance, like most things in life! One thing is for sure though – those women have got some major sewing talent! 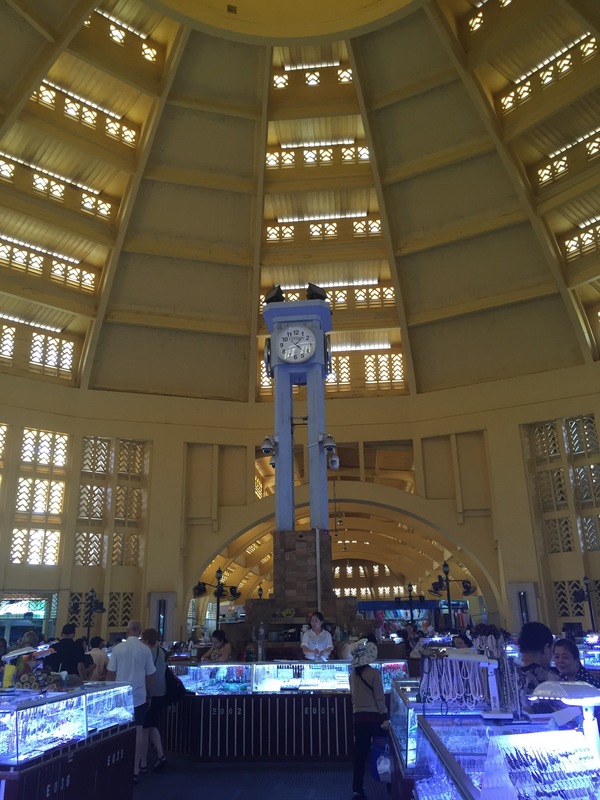 We visited the beautiful Psah Tmey or Central Market in Phnom Penh which sells everything from food to jewelery to trashy logo t-shirts! It’s in a beautiful building with a great big central dome and off the dome are a maze of corridors! Down one of those tiny corridors I was amazed to find a world of fabrics by the metre and seamstresses working away on the most amazing vintage machines. Everything from Juki to Singer was represented and the seamstresses were getting fantastic results. It made me ashamed that with my fancy computerised snazzy machine sometimes I can barely put in a zipper haha! Of course I couldn’t help but indulge a little in the mountains of fabric on offer. You had to be truly dedicated to the cause to rummage through this little lot …. hats off to PB for waiting it out as I shopped! We were lucky enough to chance upon a stall with a really lovely and friendly owner. He wasn’t pushy and just gave me a chance to peruse. They had everything from jersey to silk, so in the end I decided to purchase a selection. The poor chap seemed a bit perplexed as to why I would be buying so much fabric, he even asked me if I ran a business. When I told him I just liked making stuff I think he thought I really was mad! Here he is measuring out some fabric for me. He had to literally climb out of the mountains of fabric in his stall to cut it for me … he really was drowning in fabric! The market had some fabrics with some beautiful prints and colours which I was very tempted by, however I really wasn’t sure what I was going to use them for, particularly as I’m currently making winter clothes at home! You see … I did try and be a bit sensible! There’ll be a whole lot of French seams going on with this chiffony lot! 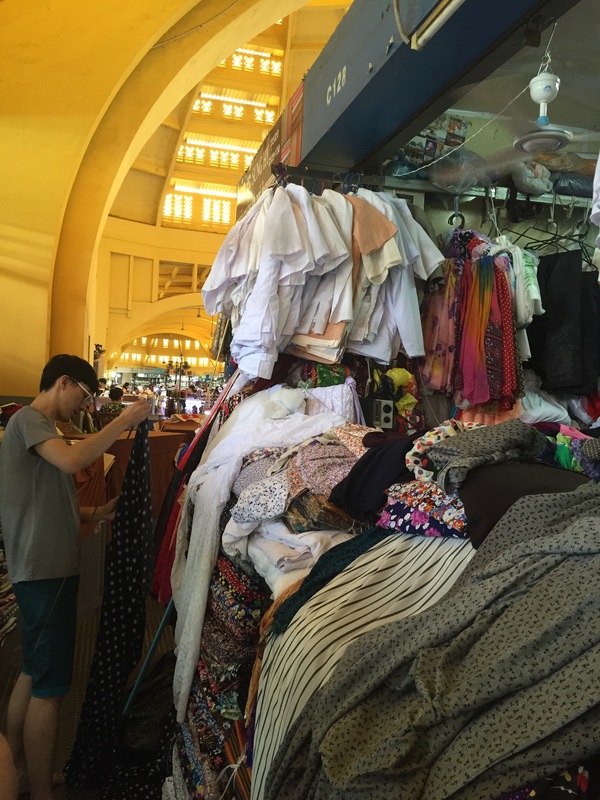 I bought a total of 15m of fabric for 30 dollars …. amazing! I think I was quite restrained not to buy more! I also picked up a whole bag of buttons for my button jar and a beautiful piece of white lace for the bargain price of 3 dollars. All in all a very successful haul considering I hadn’t planned to buy fabric or notions on my travels at all! I had an absolutely wonderful time away! Beaches and coconuts and I even met the real life Ernest the elephant! A dream come true! Now I’m back it’s time to get festive and finish off those last Christmas gifts!